It is a truism that history is written by the victors, and perhaps this is doubly so of military history, where the tendency is to relate the biggest battles, the most victorious and heroic deeds, the very best (or worst) of men. This book stands as a corrective to this belief. 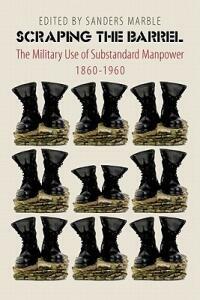 Scraping the Barrel covers ten cases of armies' using substandard manpower in wars from 1860 to the 1960s. Dennis Showalter and Andre Lambelet look at the changing standards in Germany and France leading up to World War I, while Peter Simkins chronicles what happened with the "Bantams," special units of short men used by Britain in the Great War. Often the use of substandard men was to answer the sheer need for manpower in brutal, lasting conflicts, as Paul A. Cimbala writes of the U.S. Veteran Reserve Corps in the Civil War, or to keep war-damaged men active; sometimes this ethos was used to include men who wanted to fight but who otherwise would have been excluded, as Steven W. Short writes of the U.S. "colored troops" in World War I. In the second World War it was to answer more dire exigencies, as David Glantz relates how the USSR, having suffered enormous losses, threw away many pre-war standards, reaching for women, ethnic/national minorities, and political prisoners alike to fill units. Likewise, Nazi Germany, facing many fronts and a finite manpower pool, was compelled to relax both physical and racial standards, and Walter Dunn and Valdis Lumans look at these changing policies as well as the battlefield performance of these men. In relating the stories of the substandard (for the military), Scraping the Barrel is also a humanist history of the military, of the more average men who have served their countries and how they were put to use. It throws light on how militaries' ideas of fitness reflect the underlying views of their societies. The idea of "disability" has been constructed based on a variety of physical, yes, but also social standards: as a value judgment on groups viewed as lesser-the aged, the lower classes, and those of different races and ethnic identities. From the American Civil War, through World Wars I and II, through the U.S. Project 100,000 in the Cold War, substandard men have been mobilized, have served, and have fought for their countries. These men are the inverse of the elites who get the lion's share of our attention. This is their untold history.